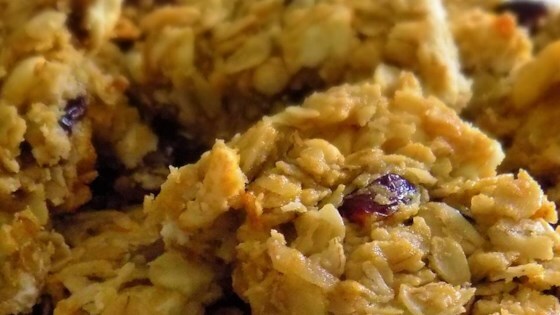 "Extra chewy granola bars. You can make them your own by picking different ingredients to add in! Try using any combination of miniature chocolate chips, sunflower seeds, raisins, chopped dried fruits, candy-coated chocolate pieces, chopped nuts, etc." Preheat oven to 325 degrees F (165 degrees C). Lightly grease one 9x13 inch pan. In a large mixing bowl combine the oats, flour, baking soda, vanilla, butter or margarine, honey and brown sugar. Stir in the 2 cups assorted chocolate chips, raisins, nuts etc. These were delicious!!! I didn't add the brown sugar or the chocolate chips to make them healthier and they came out great. The honey made them sweet enough without the extra sugar added.